This grassy groove is the Stalkers' Path. Looking beyond Martindale, the valley below, we see in the centre of the frame the small but shapely peak of Steel Knotts, the summit of which is known as Pikeawassa. Its ridge continues on the right to Brownthwaite Crag and off the picture to Wether Hill. Beyond and to the right of Pikeawassa is Bonscale Pike whose ridge rises on the right towards Loadpot Hill. 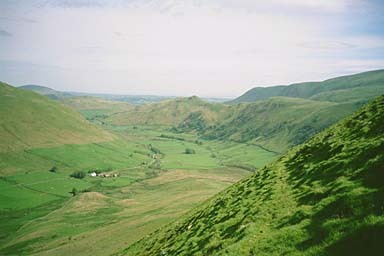 On the left, beyond the slopes of Beda Fell, is Little Mell Fell. Larger version of this picture.